For a significant part of my life I can honestly say that I worked tirelessly to get people into the kitchen to make home-cooked meals. It makes so much sense from an economic standpoint, as well as for health and wellness reasons. Home cooking is generally less expensive and healthier than meals eaten out or worse than that – purchased as fast food. But novice cooks are often overwhelmed with the idea of cooking without having a specific recipe in front of them. Especially women, in my experience. As a result, often food goes to waste, which defeats the purpose of home cooking. Cooking at home is work, let’s face it. You need to keep your pantry stocked. And if you believe in fresh food, you need to make grocery lists and shop often. But the most important thing in my mind, is to be creative in the kitchen without having recipes. A scary sounding proposition if you think that cooking is difficult. Home cooking is not difficult. In fact, it’s way more fun than being a chef in a restaurant kitchen, in my mind, because you can make whatever you want on a daily basis, to suit your tastes. Certainly prepping skills are good to know, as well as cooking techniques. But what I’m talking about is creating your own dishes based on what you have on hand. That way there is no waste. 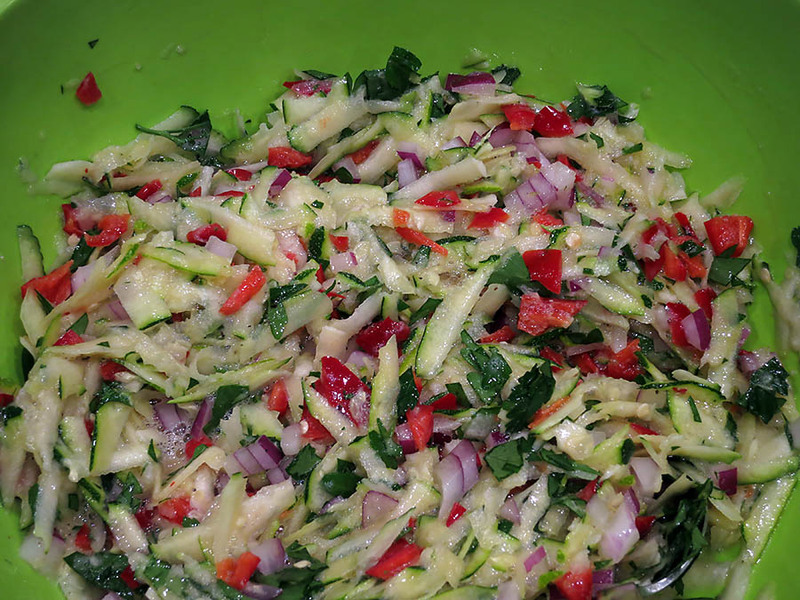 Take zucchini. It’s September right now in the US, and zucchini, a summer squash, is still growing in my garden and readily available at grocery stores. Sure, you can bake zucchini bread and muffins, but that’s not something that’s nourishing. 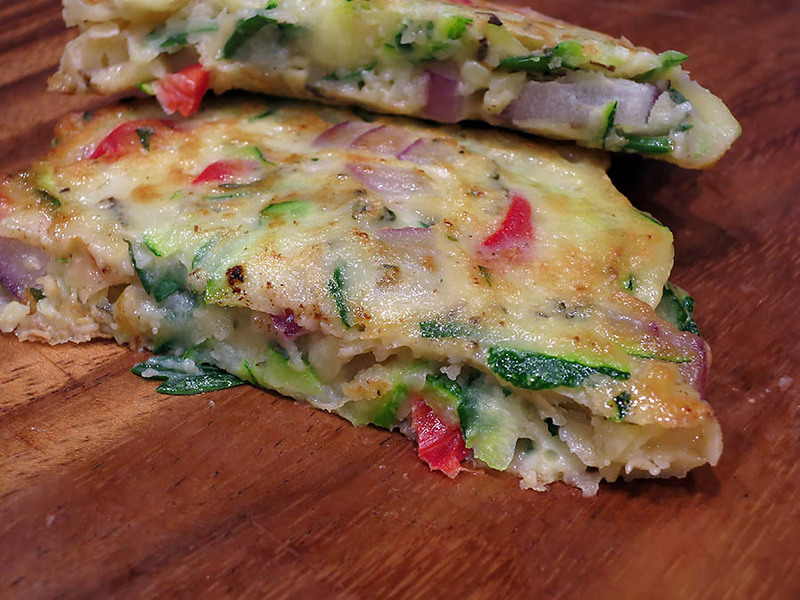 I’m talking savory zucchini pancakes – a lovely vegetarian option, or a fabulous side dish to protein. If you want an exact recipe, check out my squash and corn pancakes from last summer. It’s a little more involved, but there is a recipe. So the following is a guide to make your own zucchini pancakes. Put your personality into your own recipe. Season as you like. You’ll know when the texture is perfect when the batter is similar to breakfast pancakes – although breakfast pancakes with lots of grated zucchini! Take the challenge and see what you come up with. No recipe allowed! First, whisk your eggs in a large bowl. I used 2 extra-large eggs. 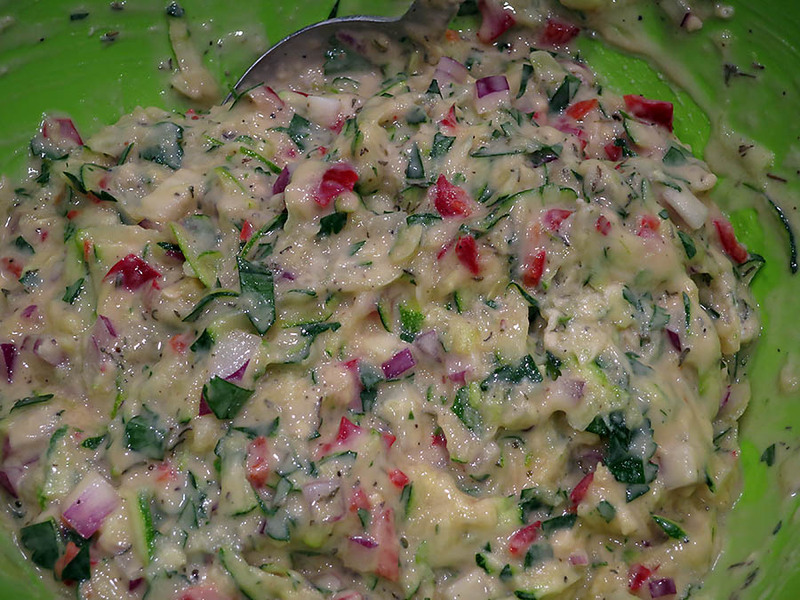 Grate your zucchini and add it to the eggs. I used a medium-sized zucchini. Prep your aromatics. I chose onion, red chile peppers, and parsley. Here’s how I chopped the chile peppers. Then add the liquid to the batter, only about 1/3 cup, and the seasonings. You can use any herbs, spices, or even pesto! Give everything a stir. The mixture should look similar to this. Begin adding flour, about 1/3 cup at a time. 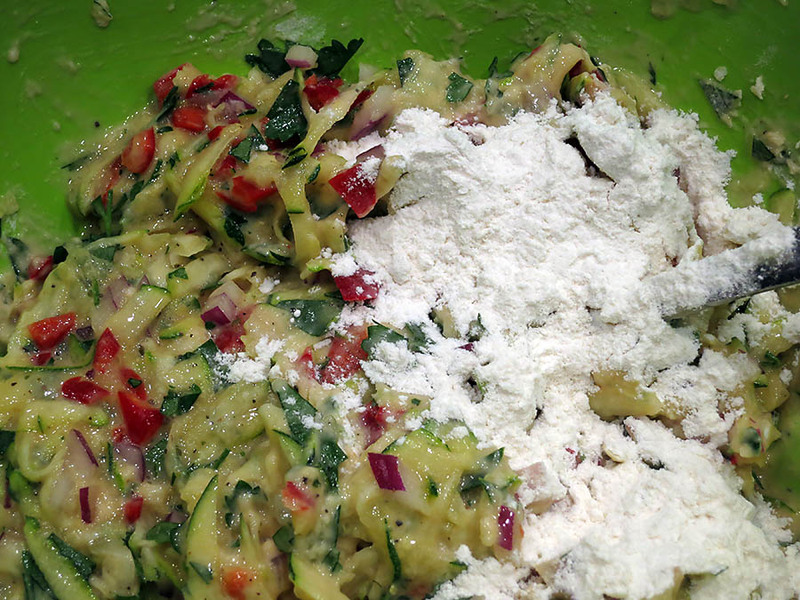 Don’t stir the flour in completely, just fold it in well enough to see if more flour is needed. These savory pancakes are not going to be as tender as breakfast pancakes, but we don’t want them tough and rubbery, either. Just add enough flour to bind all of the ingredients. Then stop. I didn’t use more than 1 cup of flour. These are not supposed to be big doughy pancakes with a little bit of zucchini. 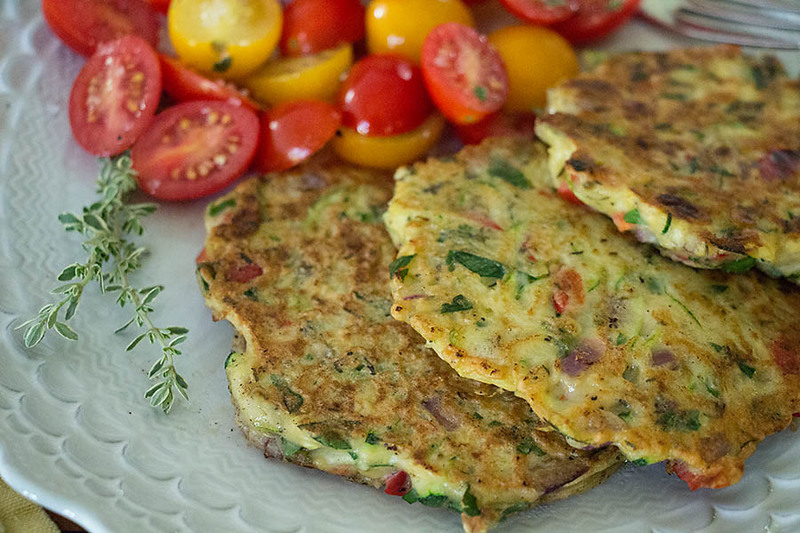 These are zucchini pancakes. Add a generous amount of butter to the skillet, and then, when it’s almost browned, add spoonfuls of batter. Take the spoon and flatten the pancakes gently. If they’re too thick, there’s a risk of them not being cooked through. After a couple of minutes, turn them over and cook for another couple of minutes. If you’re unsure of the total amount of time required to cook these through, break open the first pancake and look at it. If the middle is still doughy, as this one is, then the pancakes need to be cook longer. Ideally, the outsides of the pancakes should be crispy and golden brown and the insides soft, but not raw. Serve the pancakes warm. They’re delicious with a little dab of butter or even a little sour cream. Or simply, on their own. 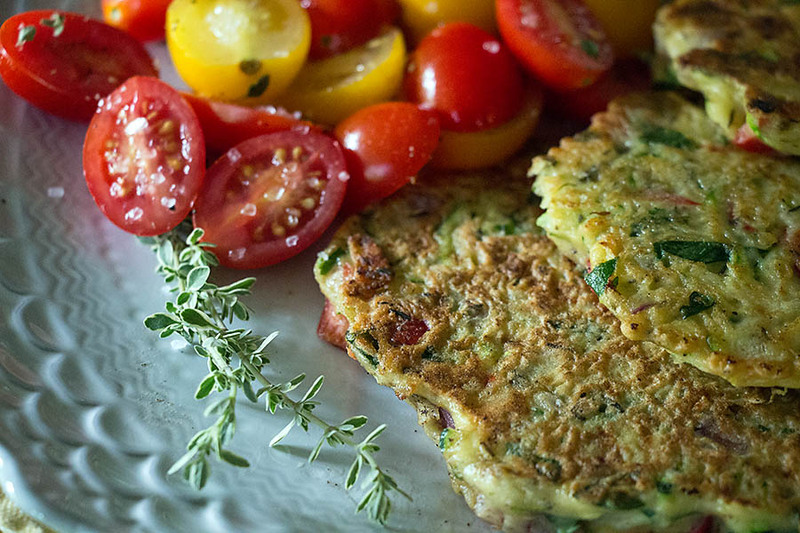 I served these spicy zucchini pancakes with a tomato salad, but my husband enjoyed the pancakes as a side dish. They also reheat very well. If you haven’t attempted savory pancakes like these before, and follow through on them without a recipe, please tell me about it. I love to see how you did. Because trust me, it will work! There was a summer many years ago when I taught cooking classes to four little girls. They were two sets of sisters who were homeschooled. Their mothers, who were friends of mine, thought that cooking classes would satisfy many interests and teach quite a few skills to the girls. And indeed, I’ve always thought that cooking classes for young people are fabulous for not only learning about food, but also grasping important applications like math and chemistry. During those classes we had a session on eggs – how to appreciate them for the wonderful little package of food they are, and how to treat them with respect in the kitchen. And one thing we made together were omelets. Now, it may not seem that creative to put an omelet on my blog, but on the contrary, I think that an omelet teaches quite a few skills. Plus, there are a lot of terrible omelets out there, so perhaps I’m doing a community service with this post. I’d like to think so. Of course it goes without saying that the ingredients that you choose for your omelet have to be good. If you’ve ever had bad, old eggs, you know how wonderful and important it is to have access to farm-fresh eggs – the kind that are almost impossible to break open because the shells are so hard. And once you’ve emptied the egg into a bowl, you see a dark, almost orange yolk sitting high atop a firm white. That’s a fresh egg, and you will undoubtedly taste the difference, guaranteed. The right skillet is important because you want your omelet to end up a decent thickness. Place your whisked eggs in too large of a skillet, and you will get a crepe-like omelet. Unless you like that kind, I don’t recommend too large of a skillet. The skillet I use for my one-person, 2-egg omelet, is actually a crêpe pan. It’s got a flat bottom and flat sides. The outside diameter is 8″; the inside diameter, or bottom, measures 6″ in diameter. 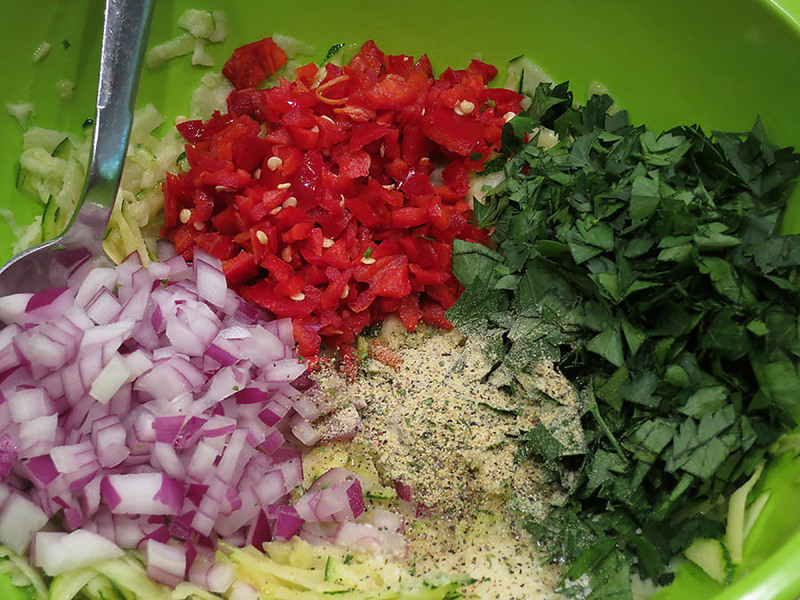 A perfect-fitting lid is also important for making a good omelet. For today’s omelet, I chose butter, 2 eggs, Gruyere, and a little leftover diced ham. And here’s what I did. Have your cheese sliced or grated, and whisk the 2 eggs in a small bowl before you begin heating the skillet. Place the butter in a pre-heated skillet over medium heat. It should begin melting immediately, but not burn. If you think the skillet is too hot, remove it from the heat source for a minute. Cooking is a lot about common sense. You need to work fairly quickly at first, but don’t worry. It’s not a race. Just have all of the ingredients available, as well as the lid for the skillet. And don’t forget to adjust the heat on the stove. That’s why there are knobs. Pour the whisked eggs into the skillet. You can see that the hot skillet has begun to “grab” the eggs and the cooking process has begun. Immediately place the cheese over the top of the eggs. If you’re using any accessory ingredients, add those immediately as well. 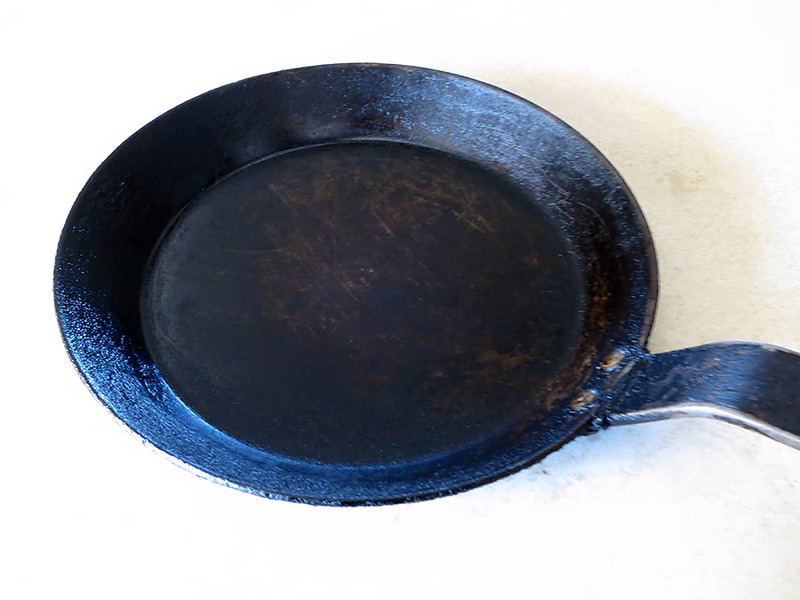 Then place the lid on the skillet, and reduce the heat under the skillet to the most minimum available to you. Most of the cheese is melted, but there is still a bit of egg that need to cook through. At this point, remove the skillet completely from the heat source, but leave the lid on. After about 1 minute, the omelet should be ready. I didn’t have enough hands to take the picture of the omelet coming out of the skillet, and, in fact, my husband only has one working arm/hand after bicep surgery last month, so I had to make do with simply showing you the omelet after I put it on the plate. Because there’s a generous amount of butter on the bottom of the skillet, the omelet should slide out easily. Do it slowly, and once half of the omelet is on the plate, simply use the skillet to flip the other half of the omelet back over itself. If you don’t care what your omelet looks like, keep it open-faced. The egg part of the omelet was cooked fully, although not nearly to the point of rubberyness. And the cheese was fully melted inside as well. I also like a little bit of browning on the outside of the omelet, but you can adjust this based on how hot the pre-heated skillet it. What’s important is that in spite of the fact that this omelet took a little time, the result is superb.